I May Be a Flake, But At Least I Am Published! Sorry for the somewhat unsubstantive post but I wanted to point you to some of my recent works to tie you over until my next "real" post. Steve Vinoski has been running the IEEE Internet Computing column Toward Integration for some 30 issues now. I have the honor to be their first guest author with "Let's have a Conversation". 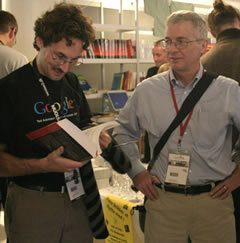 Gernot Starke and Stefan Tilkov assembled a whole book full of articles by SOA experts. The "edited by"-style books can be hit or miss but it looks like Gernot and Stefan have done a great job ensuring consistently high quality. The book SOA Expertenwissen is scheduled to be published in June. Only catch -- it is in German. Last but not least Floyd Marinescu recorded my Developing in a Service-oriented World talk at JavaZone in Oslo. The video is now available on InfoQ. Be careful to turn the volume down. And Markus is right -- I do say "sort of" too much. I guess this is the trick you learn being a consultant: "I never said to do it this way. I said 'do it sort of this way'." If you like the sound but can't bear the visuals, have a look (or listen) at my podcast on messaging systems on SE Radio. Also, if you have not seen it, go and check out Ian Robinson's article on consumer-driven contracts. I found it very interesting.